J González Requena, LJ Torres Hortelano (2017): “The Takeover of Politics by the Spectacle of the Real. Case Study: El Objetivo”. Revista Latina de Comunicación Social, 72, pp. 1.689 to 1.750. Traditionally, the field of politics, while influencing television shows, did so in a few genres ‒news and political information programs‒ whose conventions acted as a break on its treatment as a spectacle or reality show. But recent years have seen quite a transformation which is the focus of this paper. This is the takeover of the realm of politics by the spectacle of the real with no limits on the hyping of topics, characters and political conflicts. This paper conducts both a quantitative and qualitative investigation of this topic. 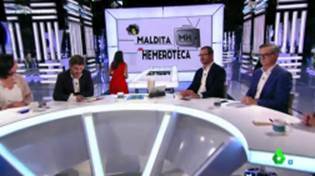 More specifically, we carry out a test for such a transformation via textual analysis of a Spanish TV program: El Objetivo [The Target/Lens] on La Sexta Spanish TV channel. 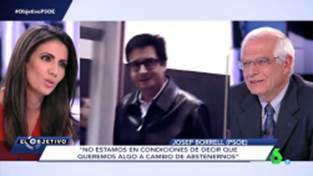 The results of the analysis confirm a fundamental transformation of the interview format in which the presenter acquires a more prominent role than the interviewee in terms of both her continual visual presence and of imposing the rules of the game. In this new format, she constantly interrupts the interviewee and demands headline-grabbing responses. Finally, the results confirm how this rise of the interview as spectacle involves an emphasis of the issues aiming to the trivialization of political content and attitudes. spectacle of the real; political communication; television violence; reality-show; television; political attitudes. 1. Introduction. 2 Material and Method. 3. 2.1. Goals. 2.2. Selection of the sample. 2.3. Methodological strategies and analysis. 3. Results: El Objetivo – October 23, 2016. 3.1. Spectacle of the Real. 3.2. 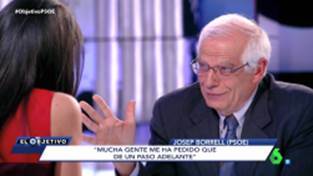 Borrell. 3.3. Valenciano. 3.4. The farewell of the interviewees. 3.5. “Maldita hemeroteca” [“Damm Newspaper Library”] 4. Discussions and Conclusions. 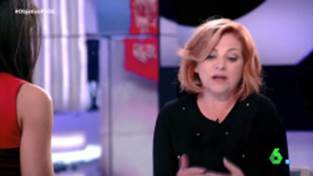 Television, and its extensions on the Web, with which the former is increasingly connected, has been the spectacle par excellence in the last decades of the 20th century and is still these days. However, to say this is not enough if we want to progress in the subject matter. That is why we want to draw attention to a fact of anthropological magnitude. Spectacles of any topic, have probably always been hand in hand with human beings in their more diverse cultures, yet they have never been so massively present than now in the entire history. There is an evident reason that can explain this phenomenon: before, in order to attend a spectacle, was necessary to get out of the house to the place where the show was going to be held. Now, instead, the show scene, has been relocated and installed in the domestic space – in the area that, by definition, is the most opposite to the show: the one of intimacy. Having said that, we could add that thanks to the smart devices, the spectacle now can accompany us anywhere, anytime. Needless to say that this spectacle now placed in our private spaces, is a realm in which violence predominates. Violence that is present in the films that are offered to us as well as in the news, and especially in the reality show, a dominant field on television in the last decades. To be more accurate, we could name it as the spectacle of real. Here prevails the violence, contempt gestures and mockery, even the most coarse insults. The spectator on his part, obtains certain enjoyment from all this, despite the fact that he despises the spectacle in which he nevertheless participates. It should also be convenient to address that contempt, since the contempt to what is enjoyable does not stop its consumption, it ends up reaching the spectator, hitting him like a boomerang. This must be understood as an introduction since the aim of this work consists of drawing attention to the last inflexion of the television spectacle. Since until very recently the political sphere, while it was fuelling the television spectacle, this was constrained to a series of genres –the news and the programmes of political information- whose norms and conventions contained to certain extent its spectacular approach. However, that has already finished. The inflexion point we want to draw the attention to is the one occurred since the end of the 20th century. It is from this point that the political sphere has been absorbed by the of spectacle of the real1, in which the lack of limit for the spectacularisation of the themes, the characters and the political conflicts is clearly evident. 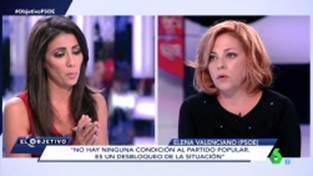 The aim of this research is to analyse how in some TV programmes about political debates in which interviews with politicians take place, the political content has been faded giving rise to the television spectacle or, as González Requena has coined it, the spectacle of the real (1989,2002,2010). 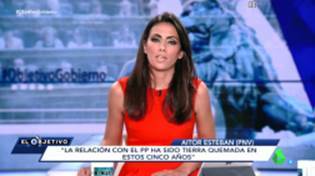 The sample is focused in a concrete example, the program El Objetivo from the free national television network La Sexta broadcast on the 23/10/16. 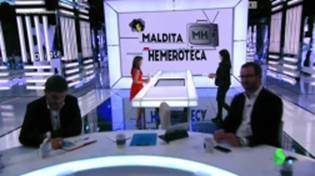 In particular, we analyse two interviews with both politicians in order of appearance: the former minister and former president of the European Parliament, Josep Borrell and the former Deputy Secretary General of the PSOE, Elena Valenciano; as well as a section of the programme, “Maldita Hemeroteca” [“Damm Newspaper Library”]. The audience rating of both the channel and the programme. Share of 23/10/16: La Sexta, 7.5%, 4th general position; El Objetivo 7.8% and 1.452.000 spectators, 14th general position. These are very significant figures considering the start time, 22.31p.m., in direct competition with OT: El Reencuentro [Star Academy: The Reunion] on La 1 (20.9%, 1st general) and “El peliculón” [“The Megahit”] on Antena 3 (13%, 2nd general), that started broadcasting respectively at 22.02 p.m. and 22.14 p.m. . 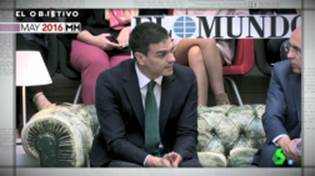 The convulsive political moment of Spanish policy. The political weight of the interviewees. With this digital tool, the well -known problem of audio-visual analysis is resolved as it allows a systematic description of the analysed object, enabling the direct formalisation and analysis of the stakeholder frames. In our case, we extend the analysis to the television contents. After capturing the frames through Encuadres of the aforementioned programme El Objetivo, we proceeded to the quantitative analysis of the visual and verbal presence of the interviewees to, subsequently, use the statistical data we obtained for a textual analysis of qualitative method. 1)The visual presence: The presence of any aspect, however small, of each of the characters in the shot. 3) The equivalent presence: that which the interviewer and the interviewee have the same degree of visual presence in the image. 4) The verbal presence: the speaking time. We will introduce in what follows the analysis of a case. 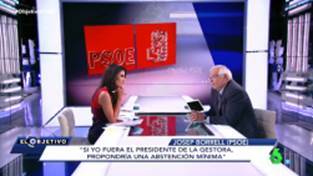 This is a political programme broadcast in La Sexta on the 23rd of October 2016. 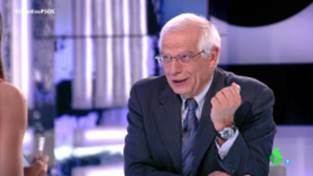 The majority one, that had won the elections with 139 votes, represented by Elena Valenciano, and the minority one, that had lost with 96 votes, represented by Josep Borrell. 00:00:00 Interview with Josep Borrell. 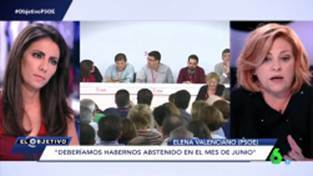 00:32:19 Declarations of some figures of the PSOE sector who have lost the ballot. 01:08:17 End of the programme. We will start the analysis drawing attention to the first notable aspect of the framing of the informative matter carried out by the programme. 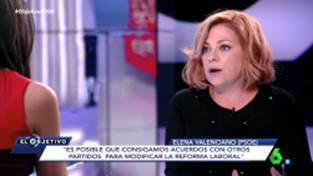 There is also another significant factor to add to the remarkable time difference: when Elena Valenciano begins her interview, she is under the pressure of having witnessed the interview of her antagonist, and also the statements of the leaders opposed to the position she represents. 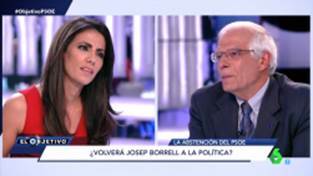 Nothing of this occurs with Borrell: Only two fragments are included during the time he is allowed to speak, that make the interview stop. 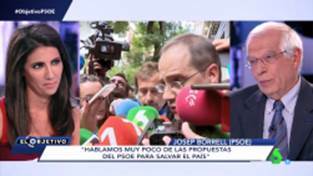 On the one hand, a fragment of the declaration of Javier Fernández, the president of the Management Committee , explaining the decision taken by the majority of the party, which took 40 seconds and a half. 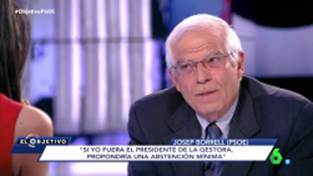 On the other hand, a brief report of 55 seconds made from the statements by Jose Bono about the process that led to the election of Josep Borrell as candidate for the Government Presidency in 1998. And, also about his fall a year later from which Borrell’s image came out favoured as the victim of the manipulations carried out by the party leadership. It is obvious that this implies a clear political posturing on the programme´s part, that has chosen to favour the discourse of the defeated sector of the PSOE, incarnated in the figure of Borrell, against the winning sector represented by Elena Valenciano. We have addressed until here factors that are not specific of the spectacle of the real, but rather correspond to the procedures of the media political posturing within the limits of the genre conventions that we mentioned above, which aim at limiting the spectacularisation of the theme tackled. We will deal now with the aspects of the programme in which the logic of the spectacle of the real is the one that predominates. A good place to start addressing the matter is to question about who, ultimately, has the predominant role in the programme. 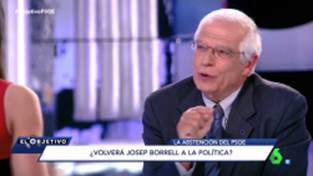 It might be thought, on the basis of the data obtained, that the major protagonism is gained by Josep Borrell. 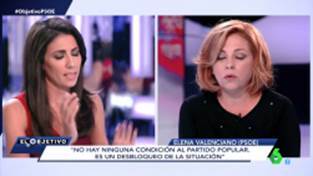 However, as we are going to demonstrate in what follows, this is not the case: the person who truly plays the lead is its director and presenter, the journalist Ana Pastor. And not only because, as the presenter of the programme, she is present in all its parts, but also and above all, because she has a massive presence in the time dedicated to the interviews. To prove this we will introduce, in the chart below, expressed in percentages, data referring exclusively to those interviews, excluding all the other factors that constitute the programme. Clearly, there is a distinct predominance of the interviewer as we can see in the category of the visual presence – with a degree of presence that approximates 100%, which is very similar to the interviewee one –as well as the clear significance of the relationship that is established between them, given the fact that both are present in almost all the scenes of the interview. No less significant is the fact that the interviewer’s verbal presence gets close to 50% of the interviewee’s one. The protagonist here is not the interviewee and his or her discourse, but rather his or her relation with the interviewer. Its significant protagonism becomes evident when observing the total data from the two interviews. Viewed this way, the data of the primary and verbal presence are levelled considerably, while the rest data of presence is clearly favourable to the presenter of the programme. Here, on the contrary, the prominent role is given to the person who conducts the interview. The core of the structure of the interview is based on the interviewer’s presence and the way she relates with the interviewees. It is also worth noting that the verbal presence percentages reach a total of 104.51. This is not an error since 2.25% of the interview time, both interviewer and interviewee talk at once. Should we consider this as an index of fluidity or exasperation? In any case, this is a typical characteristic of the current informative spectacle. 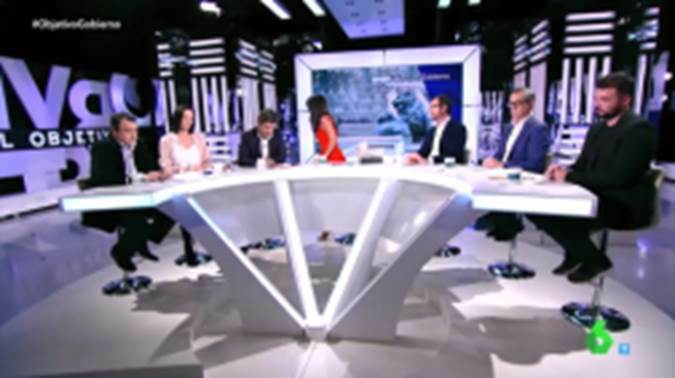 Very well-known are spectacles like La Noche [The Night] broadcast also on La Sexta, where the participants debate at once with their opponents creating a spiral of tension; the meaning of the arguments and discussions is eclipsed by the violence of the annoyed voices and a wide range of hostile gestures. 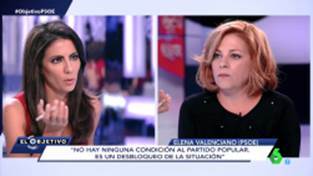 Certainly, El Objetivo, does not reach to that point, focusing on a format more contained and objective . Moreover, as we try to show in what follows, this makes this programme an ideal case to verify the distinguishing traits of the new spectacle of the policy. 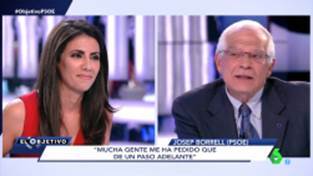 First of all, it can be observed that there is a pronounced difference in this regard –the overlapping between the interviewer and the interviewee in taking the floor– between one interview and the other: this overlapping is much bigger in the interview with Elena Valenciano –7%- in comparison to 2.36– of the interview with Borrell. The centrality of the presenter is evident by her mirror disposition, placing her as a hinge upon which both interviews revolve. She provides access then to the show scene located in the private space, in the living room, in the kitchen and even in the bedroom. She is the one who leads our gaze, when and how she wishes, to the visitors from the political sphere, who are her guests. •Pastor: A Government of Mariano Rajoy. There, you were seeing on screen our first guest. 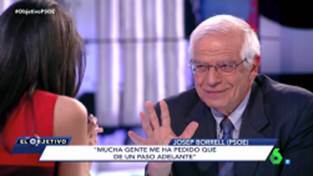 Josep Borrell, good evening, bona nit [“good evening” in Catalan]. •Pastor: …member of the Federal Committee that until now defended the abstention, with nuances, and today has defended the “no”, that is the losing option. What has happened during this time that has made you change your mind? •Pastor: you defended the abstention. In fact, you put voice to that statement we have here, the statement of the Federal Committee. 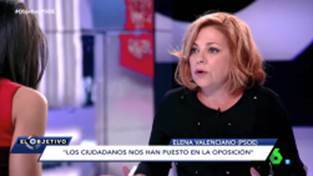 Elena Valenciano, very good evening. •Pastor: will be president. The party of Gürtel, Bárcenas, the corruption, the labour reform, the LONCE, the party of many things you have critised and that thanks to all of you is going to continue in the Government. •Pastor: that party is going to continue in the Government. Therefore, the difference is extremely pronounced. Borrell comes in with confidence, he feels very welcome; whereas Valenciano, who as the presenter has just asserted, has listened to Borrell’s interview, feels almost intimidated by the reception, which is perceived as hostile from the start. At the beginning of his interview, Borrell does not hesitate in making an implicit gesture in which is manifested the recognition of the programme. Borrell’s gaze seeks the interviewer’s complicity: Is she not the queen of the newspaper libraries? Is ‘Maldita Hemeroteca’ not a basic section of her programme, of which he, with a propitiatory gesture, declares himself implicitly spectator? It appears that the interviewee knows that his political success in the programme depends on his ability to obtain the sympathy of its presenter. A cold, inquisitive face, openly penetrating and distrustful. 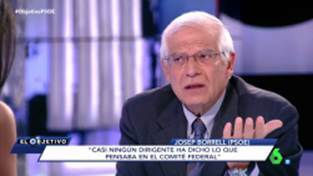 •Borrell: negotiated, with a price. Valenciano now in the centre. 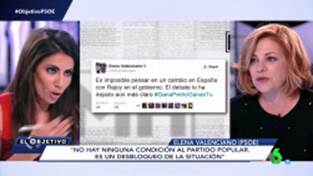 And, although this programme, by being more contained than others, does not show Valenciano’s image looking at the interview, we sense that that is now taking place. •Borrell: Mine was an ideal position. 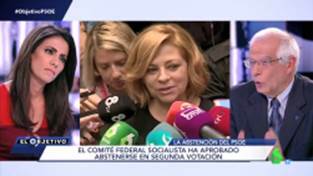 I could choose between new elections or alternative Government, if that was possible, and we have seen that is not; or to determine Rajoy’s investiture. 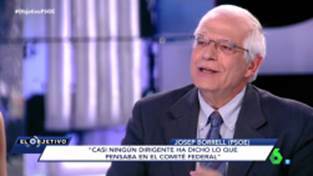 •Borrell: we have done many things very badly and it is normal to fear a punishment by the voters. •Pastor: Soto voce who is referring to Mr Borrell, who always speaks very clearly and have listened to you in the last days some... I was going to say insinuations because you do not put name and surnames. Who are you referring to? Her sympathy is possible, but has a price: all of which promotes a higher spectacular performance of the programme. 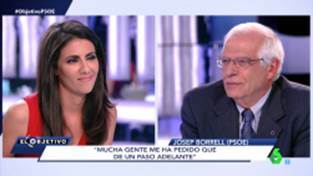 •Borrell: Ultimately, I think that what people really care about, or should care about, is what proposals have the socialist party to face the problems this country has. 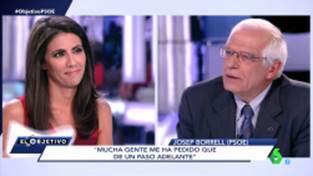 Borrell makes a lexical choice: he speaks of people instead of citizens. 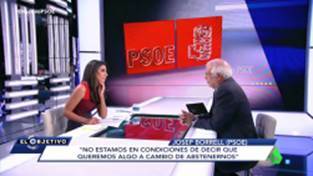 •Pastor: It does not seem that, among the PSOE leaders, you yourself are saying that, those issues are on the table. Is it a power struggle? •Borrell: Ah, naturally we have seen a power struggle. That is obvious. 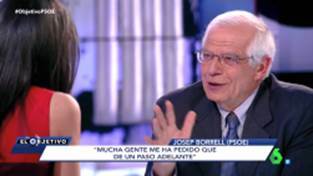 And Borrell is dragged into framing his discourse unreservedly each time more present in our political sphere: people versus power. 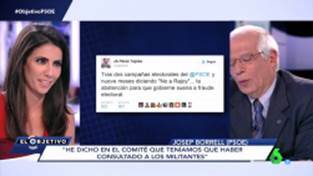 •Borrell: that the militants should have been consulted, and that that is not a symptom of the Podemos strategy, as we are told, is it? Borrell knows that one of the traits of the programme and also the TV channel is the proximity and sympathy towards Podemos. 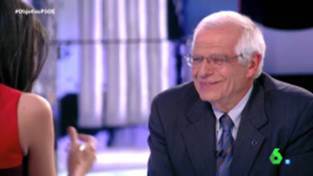 And so, he tries to achieve a complicity smile from the presenter. 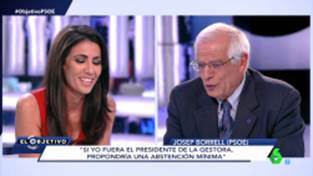 •Borrell: The German social-democratic party does not seem to be very sympathetic with Podemos, does it? Furthermore, she does not hesitate in showing with her smile that which she likes to hear. •Borrell: I try to avoid words that can be offensive, right? It is precisely the offensive, in Borrell’s words, that which increases the spectacular performance of the programme. •Pastor: Who are you thinking of? You make it easy for me to ask you. 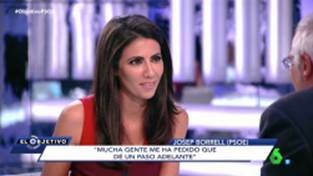 •Borrell: You might make different hypotheses about it. •Pastor: No, no, no, I do not like mind reading. I like making questions. And certainly, she acknowledges and shows her protagonism: what I like or dislike is what matters here. •Borrell: included those who defended with such ardour the ‘not is not’. I like that one, declares the presenter with her pleased smile. 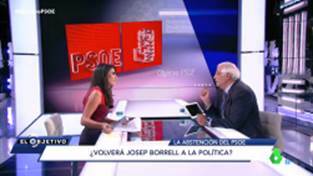 •Borrell: The one who went up to the public forum to say: if the socialist party abstained, it would lose its credibility forever. 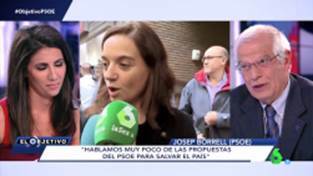 She looks at us, the spectators: makings us accomplices of her position, we engage in her smile at the expense of the offensive words that Borrell did not want to utter. 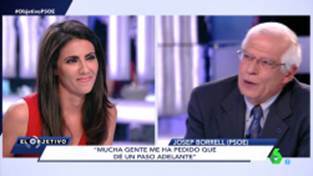 •Borrell: we tell them that we are not going to B, but instead we are coming back to A, people then probably will not want to buy more tickets from that airline. She gives a wink. Borrell senses it is the moment to confirm the complicity. •Borrell: Do you understand me? Yes, my spectators understand you, don’t you, spectators of mine? Are you enjoying, right? •Pastor: that you have been understood, above all by the spectators with that simile. The interviewer indicates with her gaze set upon the spectator’s eyes what are considered the great moments of the interview, that is to say, those that guarantee a major spectacular performance. •Pastor: to the media your opinion, have you been asked to take that step? •Pastor: …thinking about it or not. 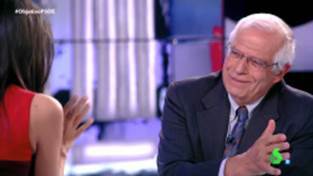 She interrupts the interviewee again: she knows – and he accepts – that she directs the order of his discourse. 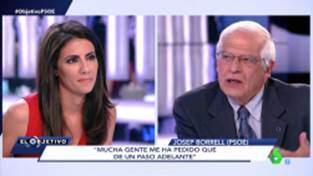 •Borrell: Look, getting back to the topic of politics or policy. Now I must not and do not want to think about that. •Pastor: Is it a resounding no? •Borrell: No, it is not a no. 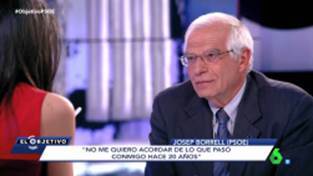 •Borrell: I have not said no. The seduction game imposes itself. •Pastor: I was going to highlight it too. The slip at the start –gerenational instead of generational- translates certain tremor in the interviewee’s effort to recover the control of his discourse. And, certainly, the mocking smile of hers makes it difficult. In this moment, he manages to contain her: she portrays an image of a feminist woman. 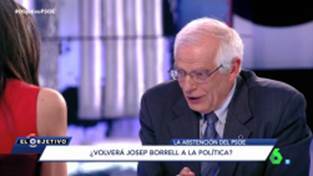 •Borrell: …of the terrible inequality, of many problems that nobody speaks about. However, this is only a partial victory, since it is her who controls the discourse timings. •Pastor: You have left a headline, you know it. You do not rule out taking that step. 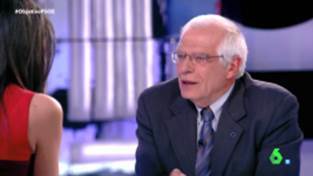 Some people say that you have gone to the congress topic, have signed for an extraordinary congress, the mayor Jul collects signatures, Mr Borrell. •Pastor: You join because you are in those matters. The seduction game imposes itself. Seduction for the power and the power of seduction: two major terms in the television spectacle. •Borrell: …and translate what I say. •Pastor: will you go to primary elections? 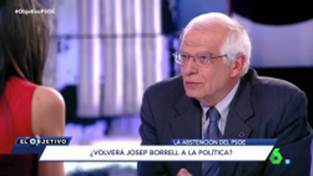 •Borrell: …primary? Primary for what? 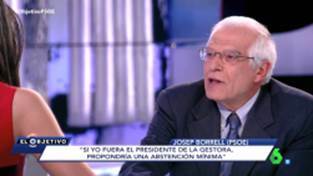 •Borrell: For the time being I will not present myself for a candidate for the primary since there are not elections. •Pastor: Well, if there are, you know. 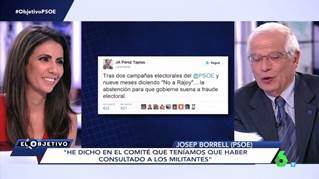 •Borrell: Yes, there are not. Aware of the interview coming to an end, Borrell makes the last effort to rescue his image from the field of power and seduction that he has been trapped in. Take me seriously, claims Borrell. And it is because he cannot look at the camera to make the call. 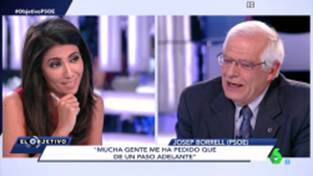 He must look at her and it is in the scene in which she appears, where the credibility of Borrell’s discourse is at stake. For a moment, it seems he has achieved it. However, the mocking smile returns; I know what you want: you are going to present your candidacy, you also want the power. 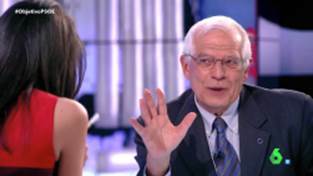 •Borrell: do not leave. What is more, the ones who are not here, please come, because for the next congress, that will be the last opportunity for the socialist party to avoid its disappearance, it is necessary that many more people join in order to change it from within. Please do not leave, come to us. However, the seduction and the power, the power of seduction and the seduction power do not exhaust at all the politics spectacle, considering that violence is its great magnitude. 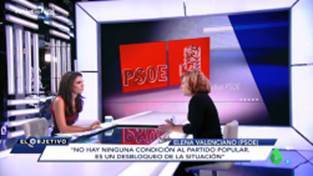 •Valenciano: If we went to a third election keeping the electoral dynamic that has been functioning these months until now, it would probably be detrimental for the left, indeed negative for the PSOE. This would be bad for the entire democratic system. We believe that is better to vote no to Rajoy in the first voting because it is a no to his policy, and abstaining in the second, in order to unblock the situation the country is in. 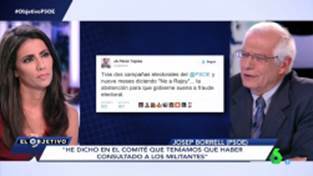 •Pastor: people at their houses right now, voters of the PSOE, voters of any other option, even people that have punished you by not voting, do not understand anything. 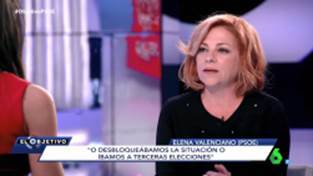 This is the dicktat that she, the people´s representative, addresses to the politician: the people, us, do not understand anything. 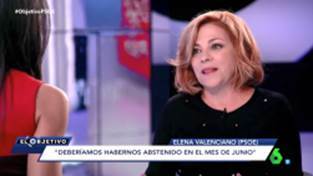 •Pastor: about what you are saying, namely, let us vote “no” in order to say that we do not like your policy, but we are abstaining from voting so that, that person and that party, I insist, I have the list here, Bárcenas, Paula, Rita Barberá, Matas, Púnica, Taula. As you may see, it is the corruption what must be understood. Is it not precisely the corruption that which is the hard kernel of the politics television spectacle? •Pastor: that party that has not changed anything, nothing has changed, you are going to let that. Shut up: I am speaking on behalf of the people. 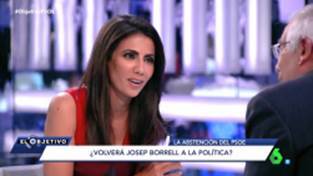 •Pastor: …let me clarify something that Borrell also said before. 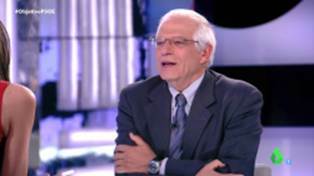 •Pastor: You say you do not want to go to a third election, that you want to unblock, that you are not going to support what the Partido Popular is going to do, and therefore it might be that we go to elections again soon. •Pastor: What have you done it for? I assume that at this point you realise that we are not watching an interview, rather, we are witnessing an aggressive indictment. 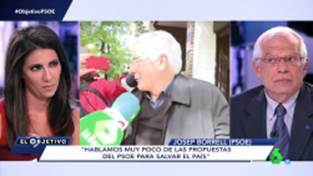 •Pastor: I insist, how can you control and make opposition, if you do, for example use the budgets, I understand that the PSOE is not going to support the cuts, so you take the government down and then the third election. •Pastor; perhaps they are not on the 18th of December. •Pastor: but they are on the 15th of March. It should be noted that, at this point, July 2017, date in which this work is being written, there had not been such elections. But let us not get into the political content of the matter, and limit ourselves to the analysis of its spectacular procedure. 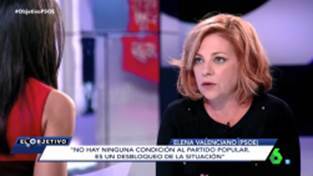 It is important to address now what is happening at the visual level: the image of the Partido Popular, and its leader, president Rajoy, functions as the damned thing in the centre of the discourse which interrupts the scene in order to be adjudicated to Elena Valenciano and the sector of the party she represents. 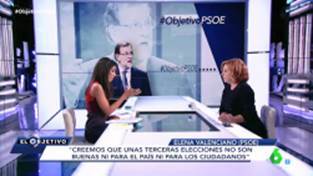 The presenter of the programme, on her part, is a bit more centred on the scene, and Rajoy’s image in the background – that looks at Valenciano- seems to emerge from her, as if launching himself with the gesture of his hand. •Pastor: abstention, you say, they do it for a sense of responsibility. Those who defend the ‘no’ that use these arguments that I am giving to you, they are not mine, they are. •Pastor: colleagues, they do it for a sense of responsibility. 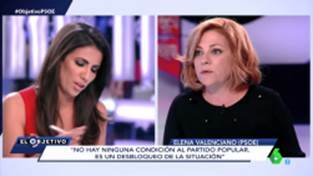 It appears then, for the first time, the major accusation: they have turned themselves in to the devil’s discourse – that, as we have pointed out, it is the PP. •Pastor: and the question now is, I ask: without conditions? Have you surrendered without conditions? 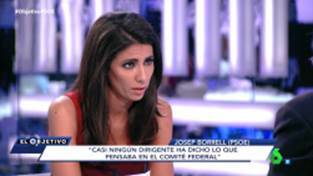 •Pastor: Borrell said it here, either we have missed something, or you have negotiated something. Or you lie –to us, to the people…but not to me. •Pastor: And which are the conditions? •Pastor: to the Partido Popular. •Valenciano: condition to the Partido Popular. 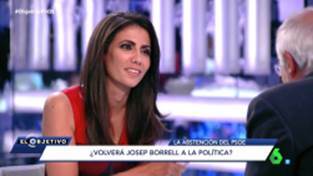 •Pastor: condition to the Partido Popular? 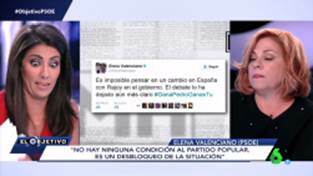 •Valenciano: No, there is not any condition. •Pastor: Is it that, that is good for…? 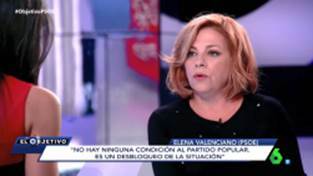 •Valenciano: …negotiating with the Partido Popular. 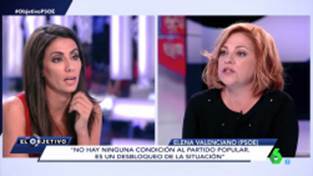 It is not a negotiation with the Partido Popular. •Pastor: Is it a surrender? •Valenciano: It is an unblocking of a political situation. And we see each other in Parliament. She, the people, says it is a surrender. Third time. 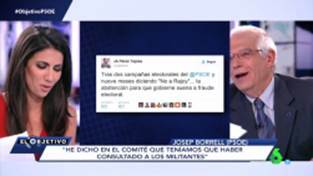 •Pastor: read it like that…and the thing is that you are surrendering yourselves to the Partido Popular. •Valenciano: has not been possible. •Pastor: Was it a mistake then or not, not having taken the road of abstention before? •Valenciano: A lot of mistakes have been made. •Pastor: for this one. Then I will ask you for the others. The way the interview is proceeding is like a crossfire in which the interview’s discourse is bombarded with constant interruptions. 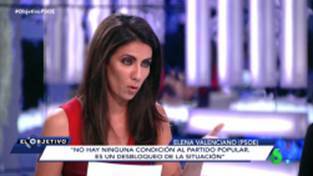 •Valenciano: Yes, the “no” to Rajoy came out in the month of December. •Valenciano: But almost a year has gone by since then. And things evolve and we must give a way out to the situation of this country. What happened in December is not the same as what happened in June. •Valenciano: and it is that the socialist party worsened its result. •Valenciano: That is a fact. •Pastor: say. You do not want to answer me or you are saying no. 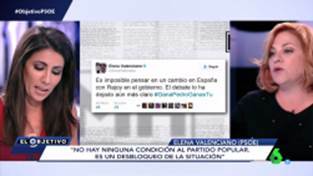 •Valenciano: I say it. I believe we should have abstained from the beginning. In June. That is what I think we should have done. 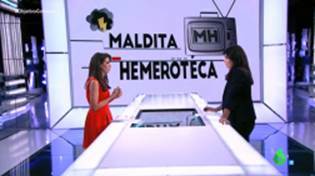 The “Maldita hemeroteca” [“Damm Newspaper Library” section of the program] arrives. 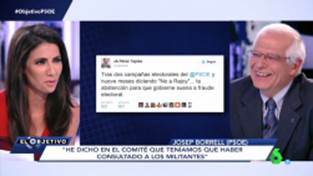 •Pastor: …a tweet of yours for example, from the time of the election debates, you said: “It is impossible to think of a change in Spain with Rajoy in the government”. You said: and besides. •Pastor: you have made it clear: Pedro wins, you win. •Pastor: Rajoy is going to be in the government. •Pastor: That has not changed. •Pastor: Those are not my words, people of yours say it. 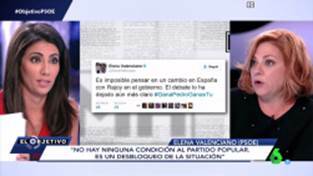 •Valenciano: that is a democratic fact. •Pastor: Tell me, tell me something that I do not know. Tell me something that I do not know. This is an imperative statement charged with arrogance by which the programme’s presenter set herself up as the utmost reference of the discourse, disowning without discussion the fact upon which the interviewee builds her argument. •Pastor: Tell me something that I do not know. I know that he has won the election. And the condemning diktat resonates repeatedly. The inquisitorial tone imposes itself. And certainly, it resonates with it the oldest topics: a devil to which the government has been handed over and to which confession is demanded. The presenter of the programme adopts an extreme position of superiority by the very fact of being the presenter. •Valenciano: Well, first I feel militant too, alright? I am a member of the Federal committee, but I am militant too. In the same way, you direct this programme and are a journalist too and you do not stop being one. I do not stop being militant. Nothing portrays better the scenic dominion of the spectacle process than the way in which the interviewee is farewelled. •Pastor: Thank you Elena Valenciano, for being here tonight. Thank you very much. 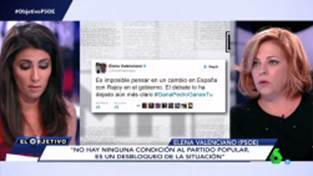 However, we do not refer now to the verbal aspect, rather the gestural, since it is Valenciano who leans forward to shake hands with Pastor. •Pastor: …also in El Objetivo. Let us continue discussing. 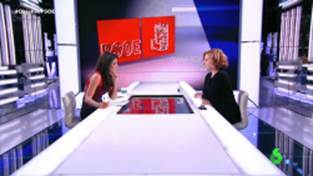 And the visual aspect, since there is no scene that shows the exit of the interviewee. •Pastor: At the table with the journalists here today and also with Pablo Simon, political scientist. Once the presenter of the spectacle takes her look away from the interviewee, this disappears, dissolves herself into the void. 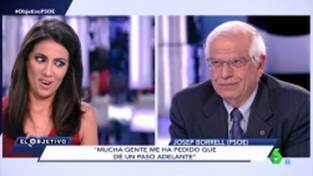 •Borrell: In any case I appreciate it a lot that you are showing your face here. We had a closed interview and you have appeared. Thank you. -despite of the last flirt of that seduction game. •Borrell: …very kind. They have told me you were terribly inquisitive, but you have not been with me. •Pastor: …until they do not answer me, I must cross-examine. Thank you very much. I really appreciate you came. We can see him disappearing to one side, while the camera follows the television star. Therefore, in the television spectacle the interviewee is nothing else than that: a disposable figure that disappears to the side when his spectacular performance has been exhausted. 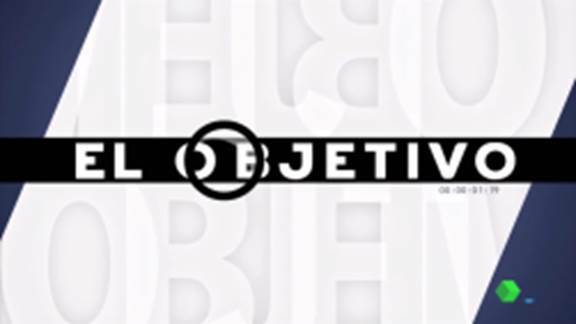 We have already shown that El Objetivo do not bet on objectivity, but it would be a mistake to think that its title pretended it. As it is not about “the objective”, it does not claim objectivity. Its name is El Objetivo and as such refers rather to an objective or goal to which aim at, in order to reveal the spectacular scene. 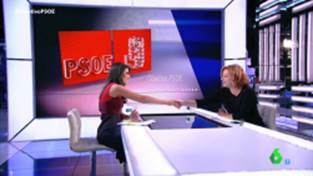 This time it was Elena Valenciano, but it could have been equally her major rival of the PSOE, Pedro Sánchez. … the politicians are there, with their heads bowed, as if fearing seeing themselves turned into targets of the “Maldita hemeroteca”. •Pastor: They have explained it. Clara, good evening. 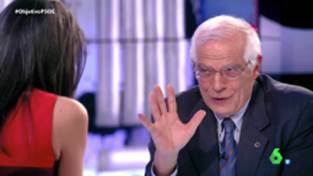 • Jiménez: Good evening, Ana. •Pastor: I directly asked you what you have found in the damned newspaper library. 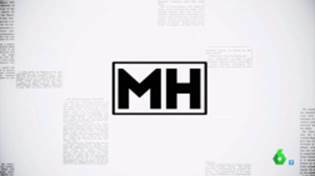 It is truly remarkable the joy, verging on enthusiasm, with which the presenter of the programme waits for the new material of the “Maldita hemeroteca”. This makes us see more clearly that this is the position and the state of mind that the listener of the discourse must assume, figure offered to the spectator who is called on to participate of the spectacle. 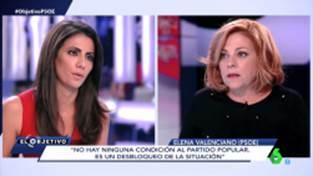 There are no concerns, not even the indignation we have witnessed directed to the position of Elena Valenciano. If some lies have been identified in the political field, there is no doubt that that is acknowledged as the best and more humorous material for the spectacle. 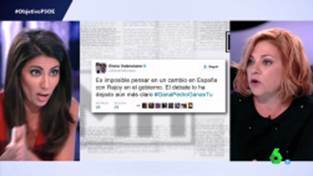 •Jiménez: we have seen that, in the past, from the beginning, the complicity in that enjoyment is evident between the two journalists. 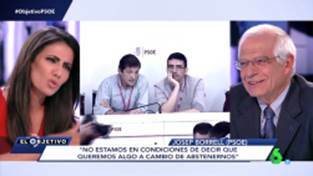 •Jiménez: That about the economic powers that pressured the socialist party and pressured Ferraz, Pedro Sánchez denied it. Carlos Segovia asked him directly in May this year, and he did not admit it. And this complicity reaches also to the spectator, who, as it seems, recognises himself as people. 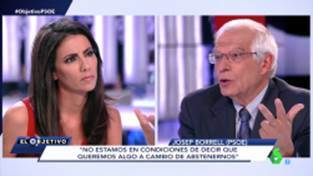 •Segovia: Seriously, it was when you said that the economic powers in the last months had tried to determine and even subjugate the PSOE, that you yourself had taken your risks crossing the Rubicon by opposing to reach an agreement with Mariano Rajoy, against the interests of those economic powers. I would like to ask you…well, economic powers like the companies of IBEX…but anyway if, you could explain that statement and particularly, if there is still that pressure of the economic powers over you and if has this been affecting your attitude in these months. 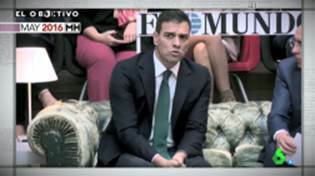 •Sánchez: I, Carlos, no, no…Seriously, and I say it…I believe that I have demonstrated that I am a politician who does what I say, eh, I am very transparent, and speak very clearly. There is no economic power that has pressured me, I have to say. Nobody has pressured me. •Pastor: Ha! Ha! Ha! There has not been any economic power that has pressured me. When do we say this happened? There are concerns, not even indignation, although indignation has indeed room in the spectacle, given its high explosive potential. We find an enjoyment focused on contempt and mockery and that, in the contemporary television spectacle, reaches the entire political set-up, which threatens to explode the entire order of our democratic institutions. 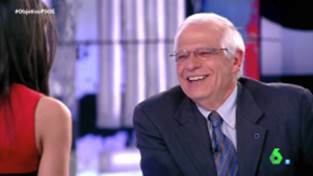 Seizing the opportunity of the current political conflicts, a television format of interviews with politicians is created since the end of the 20th century. Here the guests are interviewed through a format which is different from the traditional interview as the interviewer is now the main character instead of the interviewee. 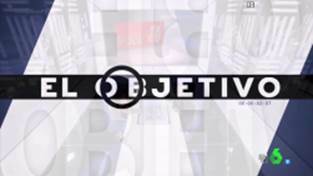 El Objetivo on La Sexta is one of these TV shows. We have checked through the statistical data obtained, through the cybernetic tool Encuadres, how the visual and verbal presence of its presenter is proportionally less if we take each interviewee individually. 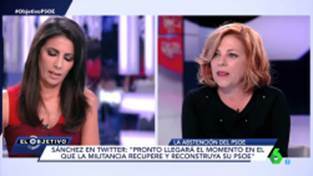 However, Ana Pastor has the prominent role in the end, if we collect and compare jointly the data from both interviewees. 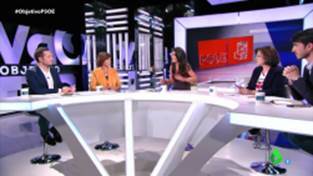 That shift of protagonism is achieved in two ways, by favouring the total visual and verbal presence of the presenter of the programme – as we have showed in the quantitative results of these staging indexes-; or, directing the interview towards the emotional terrain by locating the presenter herself in “people’s” consciousness, a term she verbalises several times. 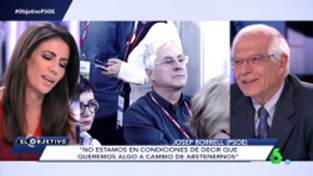 This protagonism, as we have analysed, is further reinforced thanks to the possibility of looking at the camera – option that the interviewees do not have. Lastly, the emotional interaction with the interviewees exceeds the common rules in this type of interview. Ultimately, all this leads us to speak of the spectacle of the real. From the results of this analysis, in which the interviewer gains prominence at the expense of the interviewees, the accurate political information, that is supposed to be the real goal of the programme, is absorbed by the spectacle of real. This provokes then the introduction of a bias in the information, whose consequences will need to be studied in new research, as well as the effects on the audiences, to which the quantitative data we are able to offer with our method, will help. All this leads to conclude that, as a result of this shift in the protagonism, a significant change takes place which entails the spectacularisation of the political field and, ultimately, an appropriation of the political information by the spectacle of real. This article is the result of the research project titled “Creation of a digital audiovisual methodology for the formalised and quantifiable analysis of the audiovisual texts. 1. Segmentation units. 2. Visual point of view”, reference PR26/16-20316, financed by the programme Research Projects Santander-Complutense University of Madrid, call 2016 of IP: Jesús González Requena, research group ATAD (Audiovisual Textual Analysis. Theoretical and Methodological Developments), UCM. 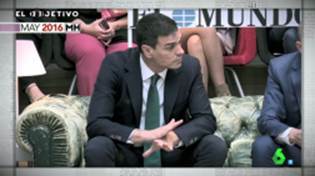 The management committee of the PSOE was created on the 1st of October 2016 after the celebration of a chaotic –and mediatic- Federal Committee in which Pedro Sánchez presented his resignation from the position of party Secretary-General and after which was notified, that it would be replaced by a provisional management committee, taking the leading role the president of the Principality of Asturias, Javier Fernández. 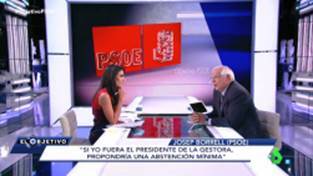 In the preceding days, specifically, on 28 September 2016, the secretary of the Federal Policy of the PSOE, Antonio Pradas, presented at the headquarters the resignation of a total of 17 members of the Federal Executive. 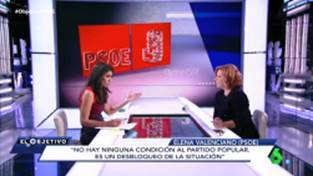 The aim was to achieve that the party was directed by a management committee and pressure Pedro Sánchez to resign as a Secretary-General. The Executive formed by 35 member (38 originally), lost through resignation two officers, that in addition to the 17 totaled 19, half plus one. 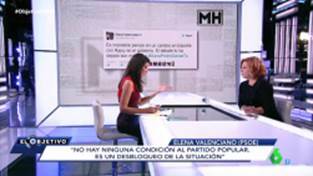 We have analysed this interview modality in El espectáculo informativo (González Requena, 1989). In this regard, it would seem that this modality came predetermined by the specific type of interviewee, as Pérez et al point out when they claim that, here it “predominates the surveillance function of the power, so that the politician is portrayed more as a social agent susceptible to be watched, than as a participant of democratic debates and reflexions” (2014: 56). As we are observing, this monitoring seems to have become our object of study; monitoring that takes over the political message in the end, transforming the debate and reflexion into a mere spectacle. 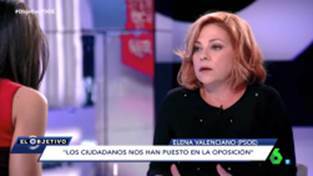 - E. Valenciano: http://www.lasexta.com/programas/el-objetivo/noticias/elena-valenciano-deberiamos-habernos-abstenido-en-junio_20161023580d312f0cf2d6cc9cb99215.html Retrieved 2017, December 1. González Requena J (1989): El espectáculo informativo. O la amenaza de lo real. Madrid: Akal. 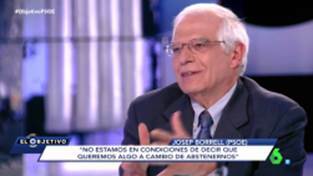 González Requena J, (2010): “La destrucción de la realidad en el espectáculo televisivo”. Sphera publica: Revista de Ciencias Sociales y de la Comunicación, 10, 17‒41. González Requena J. (2010a): “Lo Real”. Trama y Fondo. Revista de cultura, 29, 7‒28. 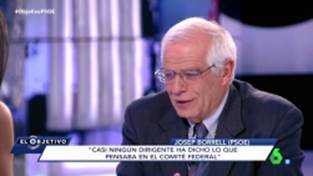 González Requena J (2015): “Contactos. 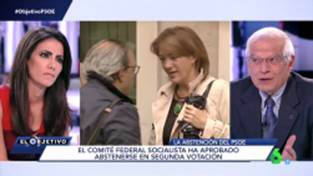 Análisis textual de una enunciación enunciada”. En Rubén García López (Ed. ), Paulino Viota. El orden del laberinto (pp. 108-200), Santander: Shangrila. Gosvig Olesen C (2017): “Towards a ‘Humanistic Cinemetrics’?”. En T. Schäfer y K. Van Es (Eds. ), The Datafied Society. Studying Culture through Data (pp. 39-54). Amsterdam: Amsterdam University Press. Redfern N (2014) The Structure of ITV News Bulletins. International Journal of Communication, 8, 1557–1578. Starace S (2014): ·The Evolution of Film Editing.” En S.M. Germani. S. Starace y R. Turigliatto (Eds. ): Titanus. Family Diary of Italian Cinema (pp. 351‒352), Rome: Centro Sperimentale di Cinematrograﬁa, Sabinae. Tsivian Y (2009): “Cinemetrics, Part of the Humanities’ Cyberstructure.” En M. Ross, B. Freisleben y M. Grauer (Eds. ), Digital Tools in Media Studies: Analysis and Research: an Overview (pp. 93‒100),Bielefeld: Transcript. Article received on 1 November 2017. Accepted on 22 December. Published on 27 December 2017.